In the animal kingdom there is a colorful bird that loves to fly around and talk, the parrot. This wonderful little bird can be found hanging out on tropical beaches or sitting on a pirate's shoulder. 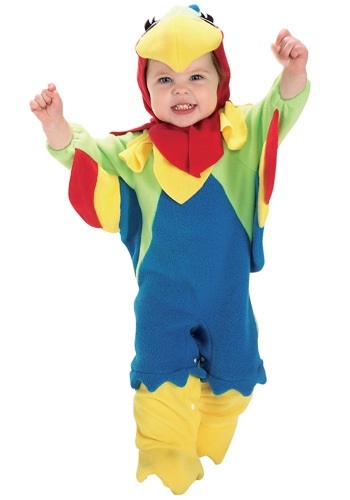 Now your little one can become this talkative bird with this great, soft costume. Arugh matey, his poop deck needs changing. Let his pirate life begin now in this adorable Cap'n Stinker Costume. It's the cutest way to sail the seven seas! He may be little but he's sailed the seven seas and stolen pirate booty! 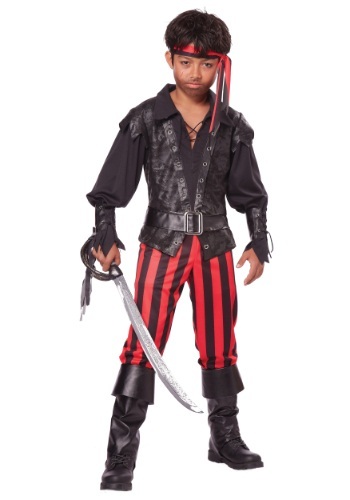 This Caribbean Pirate Toddler Costume is a great costume for little kids who like to play make believe. This costume is a complete costume that also comes with the hat and head scarf. When we found out about Briny's school for piracy gifted children, we were scrambling to enroll our kids. A school that gives them both a solid education and the saavy to rule the high sea? That's a worth a whole chest of gold for tuition! 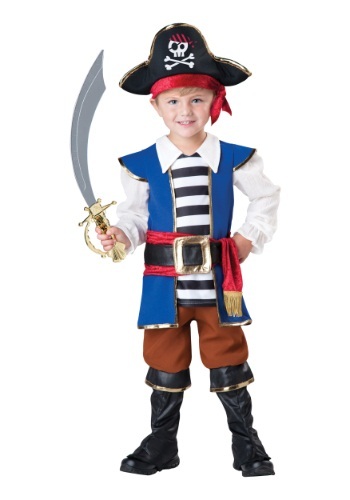 Have your little guy ready for the first day of school with this Briny Buccaneer Costume. His winning look will have him at the top of the class in no time! Jack Sparrow better watch his back because there's a new pirate who is training to be the baddest, roughest, and toughest pirate sailing the vast deep blue sea. 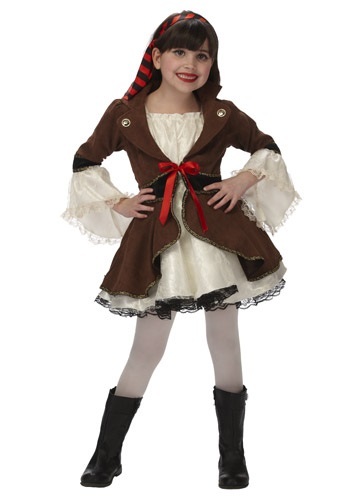 This Child Buccaneer Sweetie Costume will make your child feel look and feel like a pirate with a cute edge. Pick up a sword for a menacing look or even an eye patch! Does your child have what it takes to start a pirate crew? He's going to have to have a robust skill set to become a successful privateer. First, he'll need to be a top notch recruiter to fill his roster with the saltiest sea dogs. He'll also have to be a ferocious warrior capable of taking on a whole ship of really cheesed off Colonials. Lastly, he'll have to have the wisdom of a true leader. If that sounds a lot like your boy, congratulations! You'll be able to retire early, because he's sure to be bringing home chest after chest of treasure in no time. Start his journey towards fame and fortune with this exclusive Pirate Captain costume! 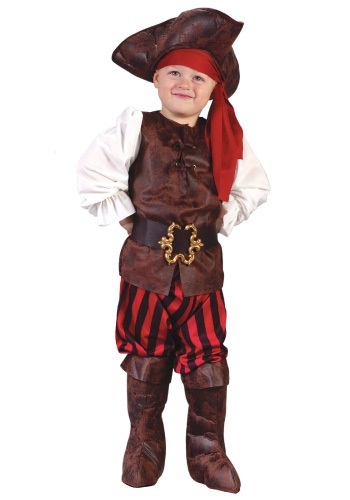 Give your child a chance to become the greatest pirate of the high seas in this Pirate King costume. He'll be ruling the waves in no time while collecting every treasure chest he comes across. Be sure to pick up a pirate sword so he'll be set to take on any challenges. 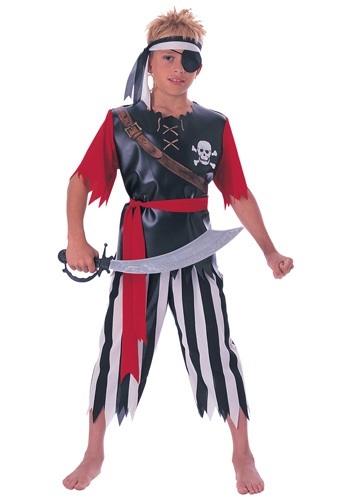 No one will want to cross him in this Child Swashbuckler Costume! Add a pirate wig, makeup, a toy pistol or cutlass and small shield and he's ready for adventure. Then choose a fun pirate name to flesh out the character! When your girl suits up as Audrey the Pirate, there's one thing that we can be sure of—sailing the seven seas will have never been cuter! She might be more prone to tea parties than plundering, but that's okay, we think the pirate crew will be better off with her taking the lead. Outfit your girl with this cute look! Hey, this pirate looks pretty good in pink! Just because the rest of her crew is a bunch of scallywags, doesn't mean that she can't be an adorable little buccaneer. Outfit your little girl with this costume, and she'll love the elegant style. And you'll love having a notorious pirate on your side for a change! 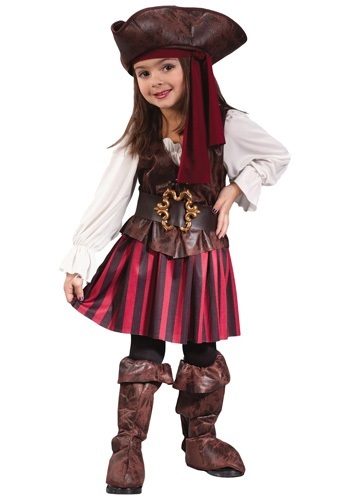 Get her ready to set sail at her little costume party with this Vivian the Pirate costume! 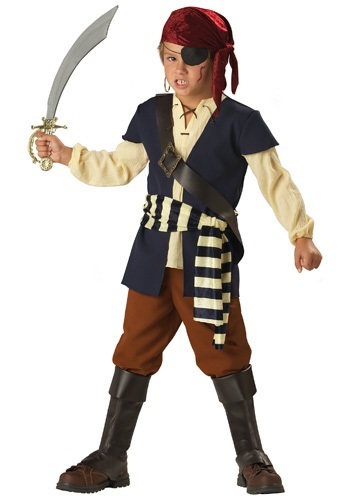 Your son can rule the Spanish Main in this El Capitan Child Pirate Costume!Give him a toy pirate sword or pistol and he'll like a real pirate--then all he needs is a treasure map. Find the buried treasure in this Girl's Posh Pirate Costume. You'll be the most stylish pirate on the ship! All you need to add is a weapon and a pirate's swagger. Just because she forces people to walk the plank during the day, doesn't mean she still can't love pink. 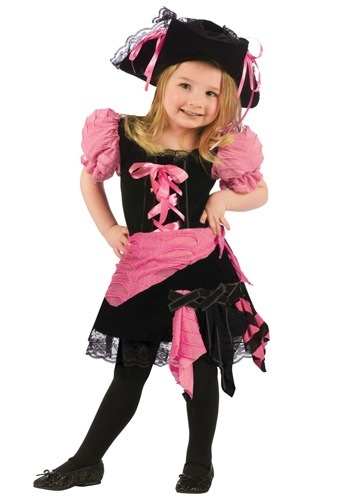 Look sassy while searching for buried treasures in this Girls Pink Caribbean Pirate Costume. And don't forget to accessorize with every girl's best friend, her Pink Pirate Sword. The best pirates wear pink! 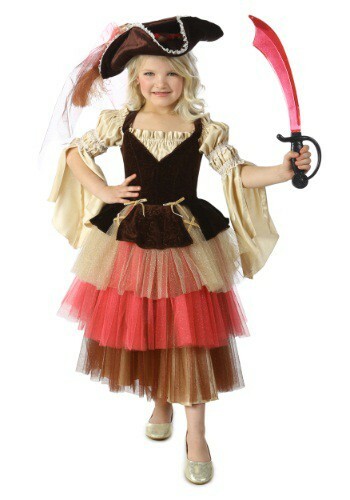 And this Girls Pirate Princess Costume makes you the pinkest of them all. Just add a pirate cutlass or pistol, and you're ready to pillage! The ocean is filled with all sorts of pirates ranging from the viciously mean to the down right adorable. When it comes to the adorable bread of swashbucklers you have to keep your eye on them because you'll never know what they'll do. They trick you by thinking they're completely innocent and then they'll steal treasure right behind your back. 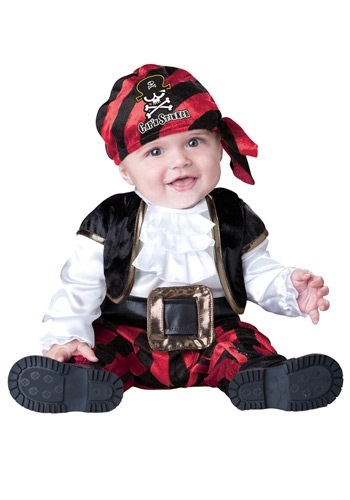 Now your little one can become one of those types of pirates in this cute costume. It's a pirate's life for this little ship mate. She can't wait to reach shore so she can look for that buried treasure. This Girls Punky Pirate Costume is perfect for young adventurers. You can pick out an eye patch, black boots, and a toy sword as fun accessories to pair with this costume! It's the pirate's life for this girl! She'll steal your ship, make you walk the plank, and not to mention steal your booty right from underneath your nose! 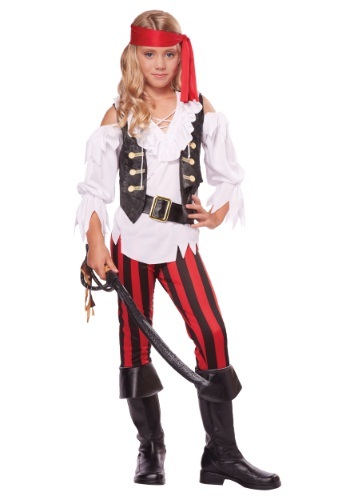 This High Seas Pirate Girl Costume is a great costume for girls because of the cool black & red tattered skirt and the included belt that cinches around the waist. Just make sure to grab your sword to protect your treasure! 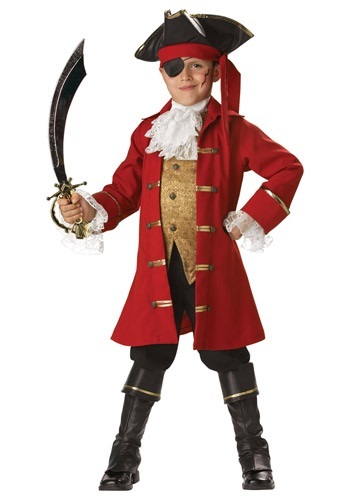 Transform your child into a rebellious pirate with this Kid's Cutthroat Pirate Costume. Complete the pirate look with an eye patch, wig and toy weapons such as a cutlass or replica flintlock pistol, and he can be the menace of the seven seas! On the high seas there is one rule amongst the best of all swashbucklers, there are no rules. If you need to cheat and steal to make sure you're the one with the treasure map then that's what you have to do. Because you when you're amongst thieves you never know when someone will be coming up behind you with a freshly sharpened sword. 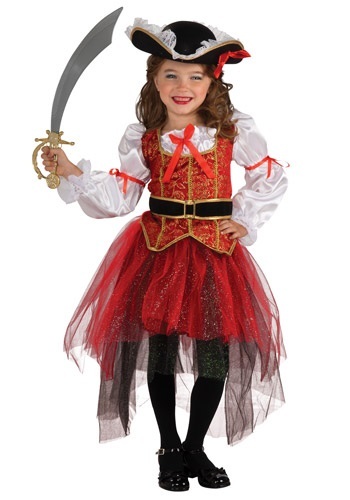 But now your little one can become the greatest of all pirates in this great buccaneer costume. 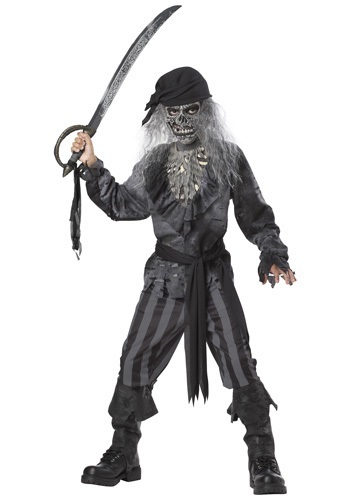 Scare your shipmates when you wear this Kids Ghost Ship Pirate Costume! It includes a shirt with a detachable chest piece, pants, full-face mask with attached hair, waist tie, bandana, and boot covers. Add toy weapons such as a sword or replica flintlock pistol for an even more fearsome look! Before you can head out to the high seas, you have to practice your sword-fighting skills. Practicing with a tree or bee is always a good choice. The goal here is to be fast and effective. But, a good knowledge of ships is also a plus. So for everyone's safety, maybe you should just stick to learning about ships. Yo ho! Heave ho! Way, hey, blow the man down! In this Pirate Captain Costume he'll be ready to sing sea songs all night as he commands his pirate crew on Halloween. Leave off the eye patch and earring, tuck the scarf up into the hat, and this costume would work as a colonial gentleman or a British redcoat from the Revolutionary War. Is your little one ready for an adventure on the high seas? If so then they'll need to dress the part of a true swashbuckler with this pirate costume. Once they wear this they'll want to jump on their own pirate ship sailing away to find some treasure. 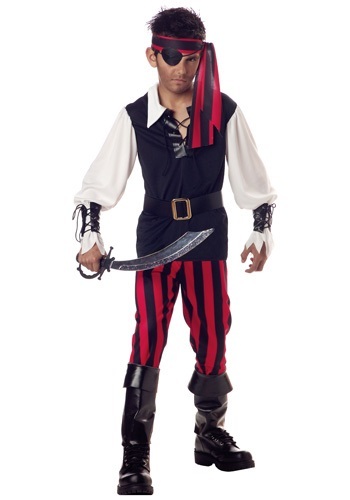 This Halloween get your child set for a fun time in this great pirate captain costume. 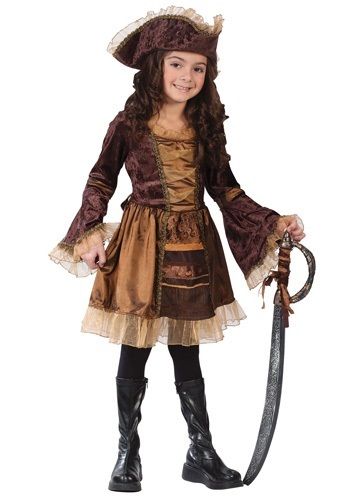 This exquisite Pirate Lass Child Costume keeps the authentic pirate look and adds some class to it. The dress is styled to look like a peasant blouse, corset-laced waistband, and skirt. To make your look even more authentic, add toy weapons, a treasure map and spyglass, and a treasure chest purse for collecting your Halloween bounty! Smell that salt water and hear those gulls? Get used to it cause it's going to be your new life on the high seas. 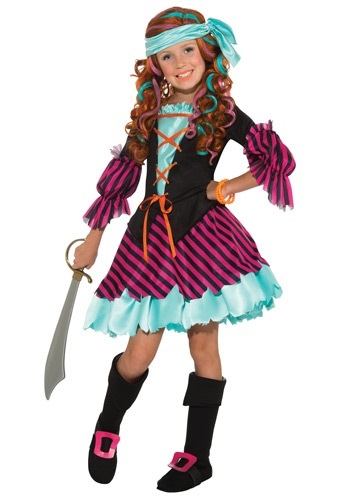 In this Rebel Pirate Girl Costume, you'll be the queen of the high seas! Just try not to get sea sick! Those waves can get pretty rough during storms! Let's start by giving your ship a stylish makeover. New paint, sanding, barnacle removing--all done! New flags strewn up. No one will want to face off against your beautiful ship when you set sail as captain in this Teen Charming Pirate Captain Costume. Is a pirate's life for you? Do you enjoy pillaging, singing sea shanties, and sailing on the high seas? If so, then this is probably the perfect costume for you, but the ship and crew are not included. Oh, and neither is a tall man with a beard and eyeliner, but I'm sure he won't be too hard to find. 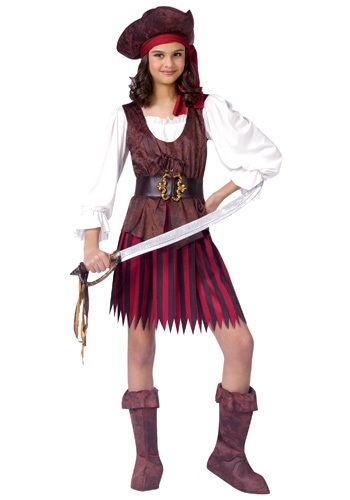 This Teen Pirate Maiden Costume is a fun way to get ready for a treasure-hunting voyage. Complete your costume with laced or buckled boots and accessories such as a spyglass, treasure map, and treasure chest purse. 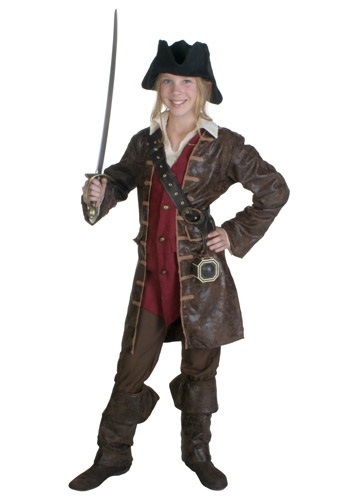 Commandeer your choice of the British Royal Fleet, save Will Turner, and find a treasure all before dinner in this Teen Realistic Caribbean Pirate Costume. Yes, they may think that you are a joke, but deep down everybody knows that you are the toughest, smartest pirate on the Black Seas. 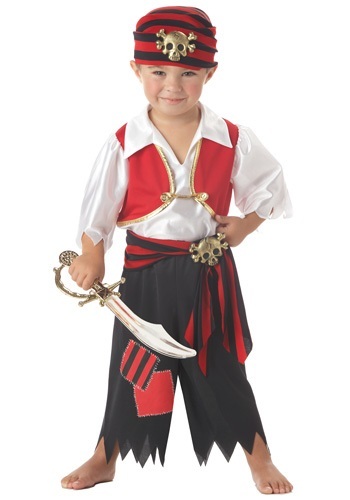 Let your child live a pirate's life in this Toddler Ahoy Matey Pirate Costume. Add a pirate hat, boots and toy weapons, and he's ready for a Halloween treasure hunt! 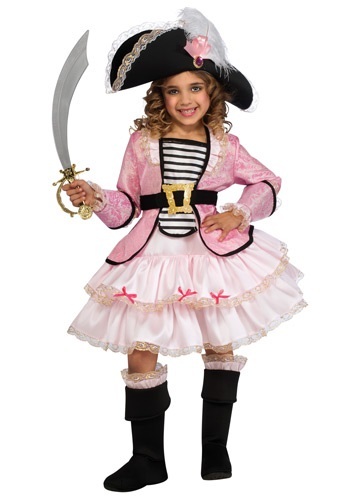 Your daughter can now be a pirate princess with this Toddler Girl Pirate Costume! She's sure to be the focus of attention with this intricately designed costume that has details you would expect to only find for a much higher price. Give the costume even more impact by adding toy weapons, a treasure map and a pirate spyglass! Ahoy matey! 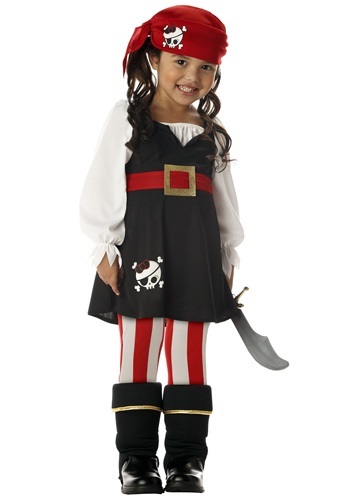 When your daughter wears this Toddler Girls Pirate Costume she won't just steal treasure--she'll steal hearts! Add fun accessories such as our toy parrot, telescope or treasure map and she's ready for adventure. Face it. Your little girl is the type of kid who likes to go on adventures and find fabulous treasures and she deserves to look cute doing it. Those old pirate outfits are definitely not for her, so we whipped up a little pirate costume that will keep her looking like the little cutie she is, all while encouraging her adventuring spirit. 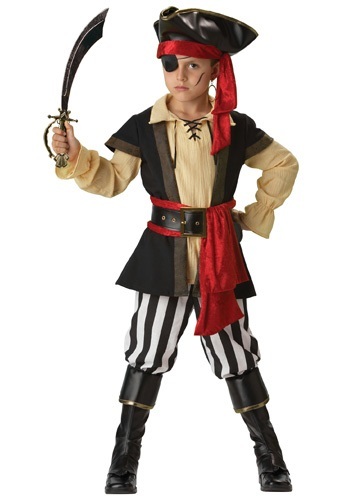 If your child has already worked his way up his crews ranks, surprise him with this Pirate Captain costume. We're sure he'll be excited to be taking the helm of his ship. His friends might not like that he got picked to be captain, but we're sure he's going to be a fair and just leader. After all, he's going to make sure they raid the Spanish galleons for candy. And that's sure to keep the pint sized pirates happy! Yo, ho, ho! This pirate is off to see what plunder and pillage he can do! 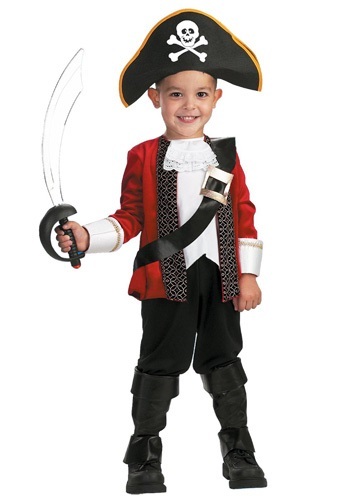 This Toddler Pirate Costume gets your child ready for a Halloween treasure hunt. 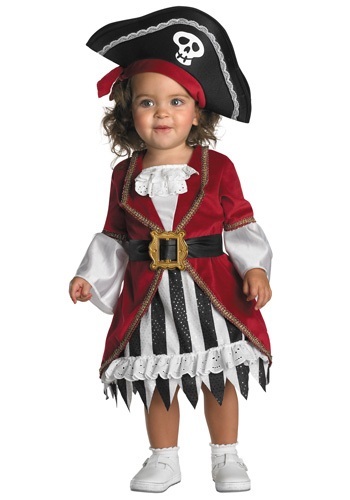 Complete this darling Toddler Pirate Cutie Costume with black or red & white striped tights and black shoes, then give her a pirate's treasure chest bag for collecting Halloween goodies.